The ‘90s were a crazy time. People were wearing spandex bike shorts for fun and fashion. You thought shirts and shorts that changed color with your body heat were the coolest thing ever, until you wore one to the high school dance and realized that they show all your friends how much you were sweating from your armpits while you danced with Becky to “More Than Words.” Also, Zubaz were a thing. The 90’s made a critical contribution to pop culture. It would go down in history for ushering in an era of pants that make it look like you were born with an embarrassing and potentially uncomfortable pelvic disability! These low-hanging pants, however, were both fashionable and functional, as demonstrated by some of the decade’s most popular rappers. Did it look weird to wear parachute pants with shiny black dress shoes? Yes. Did anyone who was cool in the ‘90s remotely care? No! Want to know why? Because the best rappers rocked them. So if you think that you’re still too legit to quit (hay haaaaaaay!) 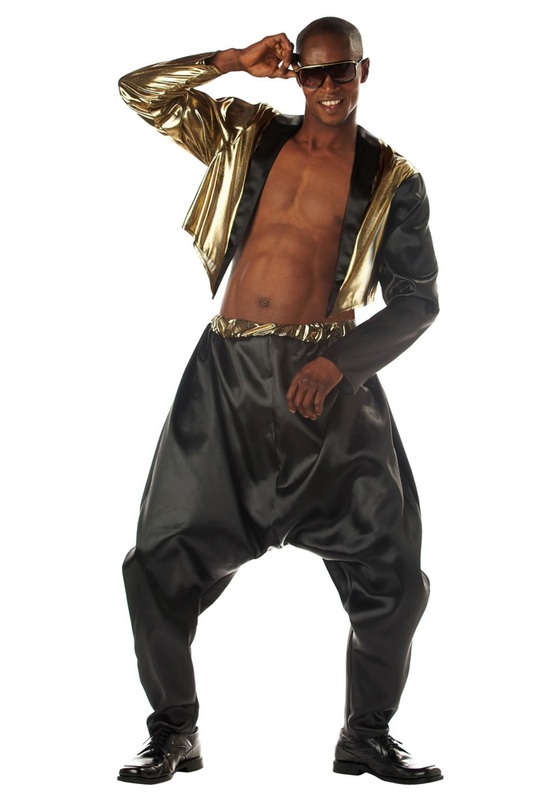 and you want to relive the days when it was acceptable to wear parachute pants, then you need this old school rapper costume. Think how awesome it will be to freestyle on the mic at your next costume party. With these fresh new threads, you'll be ready for rapping and of course, some legit dance moves.